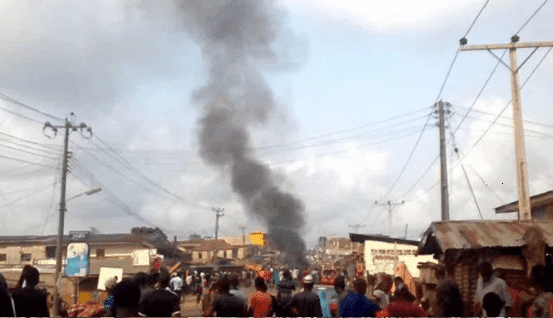 Tension has now enveloped the people of Ikeduru local government area, following the inability of law enforcement agencies to apprehend the brain behind three suspects who allegedly tried to bomb the local government collation centre during the last governorship/house of assembly elections in the state. This incident happened at Iho, the collation centre for Ikeduru local government area. South East Voice gathered in Owerri, that the three suspected bombers were arrested by the military while in possession of improvised explosive devices, IED. at the collation centre as they were reportedly waiting to be given an order to blow it up the centre and in the process, kill their targets before they were discovered and subsequently apprehended. Ikeduru which is one of the nine local government areas in Imo East Senatorial district can boast of prominent personalities like the former governor of the state between 1992 and 1993, late Chief Evan Enwerem and an elder statesman, Chief Emmanuel Iwuanyanwu among others. However, investigations carried out by South East Voice revealed that the indigenous people of Ikeduru now live in fear of the unknown amid the calls on the police to arrest the sponsor of the planned bomb attack whose name was said to have been mentioned repeatedly at the time the suspects were arrested by the military. Eyewitnesses at the collation centre had told the South East Voice that, “While all of us were at the collation centre waiting for the arrival of results from the various polling units, we noticed some strange faces of some huge and tall boys around the area. They were always going into the centre and coming out of the premises. “A lot of people became apprehensive because due to their suspicious movements. Initially, some of us thought that they came to the centre to scatter the process and destroy the result sheets and other electoral materials. “By the time the military noticed their strange movements and accosted them, it was then discovered that one of them had some IED in his possession. My brother, that was how we were saved from the tragedy of being blown up.” It was learned that the delay in charging the suspects to court or unmasking their godfather had resulted in the deluge of protests by the people calling on the security to expedient action over the matter. At the Imo State police command headquarters in Owerri, last week, some protesting youths demanded further arrests of those behind the act. The youths led by their leaders insisted that a name has been mentioned to that effect adding that they were troubled by the fact that the suspects were yet to be arrested and prosecuted. But, one of the leaders of the protesting youths, Samuel Nwokocha, said, “We also note with dismay, pain and regret that the hoodlums were hired with a clear mandate to bomb the collation centre at Central School Iho, in a bid to kill as many people as possible. “After being arrested, the suspects revealed the identity of their sponsor and he is still moving freely along the streets of Owerri, unchallenged. “We also heard that the bombers have been released even as recorded videos of their confessional statements have saturated the social media.” Another youth leader, Bright Ahamefule, who spoke to South East Voice at the venue of their protest, called for the arrest and prosecution of the alleged financier of the aborted bomb attack. Ahamefule said: “We are here to call on the police to arrest the sponsor of suspected bombers who came to take away many lives of Ikeduru people that came out to vote. “How can somebody’s name be mentioned by the arrested suspects and the police allowed the person to be moving about as if he did not do anything. “What we also need is total security of the areas concerned…” A known community leader in Ikeduru, Vitalis Ajumbe, did not hide his impression about the development. According to Ajumbe, he was the target, of the suspected bombers. He expressed disenchantment on the outcome of that incident and wondered why somebody would think of plotting to cause mayhem on Ikeduru sons and daughters who have innocently came out to exercise their legitimate rights. “I wonder why they are doing this, I have not snatched ballot boxes before. At a point, suicide bombers were at Ikeduru collation centres and I know that I am the target. I was told that they were eleven, three of them were arrested. “The videos are going around now that an Ikeduru son was mentioned to have sponsored them to come and kill Ikeduru sons and daughters. This has gone beyond election otherwise other elections in the state may take the same shape.” The Imo State Police Public Relation Officer, PPRO, Orlando Ikeokwu, had confirmed the arrests of the suspects, informing that the suspects were with the military, even as arrangements were on for the military to hand them over to the police. Photos of protesting youths from Ikeduru local government area, demanding for the prosecution of suspected bombers and their sponsors, during the governorship/House of Assembly elections, at collation centre, Iho.